The JB-D installation system allows for scheduled, accurate window and doorset installation in accordance with RAL guidelines and accommodates all dead and imposed loads. Used for aluminium, timber and PVCu windows, the system is ideal for high rise residential and commercial buildings. The JB-D system is fully 3D adjustable to easily compensate for constructional tolerances. The installation cantilever is from 30mm up to 150mm and can be positioned according to the optimum isothermal profile. It is a simple, quick and secure solution for installing larger, heavier windows and doorsets and requires no costly additional support components. The sealing process is not hindered and there is sufficient space for insulation and sealing materials. The robust design of the assembly gives assurance against potential post-installation problems. Its excellent quality provides durability and cost-effectiveness. Poor design and incorrect installation of windows and doors can lead to structural problems, condensation and mould. Our technical and sales teams have years of experience and are happy to share their extensive knowledge through CPD and practical training to install the JB-D® system. The JB-D brackets are pre-assembled with a fixing plate and are used for perforated brick, sand-lime brick and concrete on the jamb of the window. JB-DK brackets are pre-installed without the window on the cill of the aperture and can be used on sand lime brick, concrete and perforated bricks. The JB-W brackets for the JB-D systems come in two angled sizes: JB-W-70x58 and JB-W-120x58. The JB-D/L is an ideal solution for planned and safe window installation for new buildings and renovations. The system provides quick and safe installation at the edge of the sill, with the JB-D®/L-P plates being pre-assembled on the front of the frame providing a flush application projecting up to 40 mm. This system is suitable for multi-functional sealing tape and provides cost-savings thanks to its rounded form. 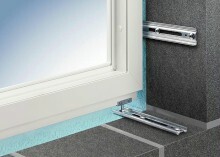 It allows for side window installation without support and spacer blocks and gives a balance of building tolerances. The number of heat bridges has been minimized. The edge distance of 60 mm is maintained and only one fastening is required for mounting into the masonry. The system has been fully ift tested.